A rendering of the expanded MasterCard Batter's Eye Deck and new Bullpen Landings. Provided by New York Yankees. 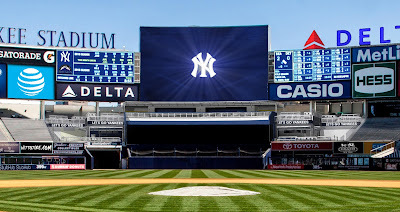 The new Yankee Stadium opened in 2009, and it will be undergoing its first major changes during this baseball offseason. The Yankees announced on Monday that the enhancements will include seven new social gathering spaces and additional dynamic food and beverage areas. Construction will begin this week for an anticipated debut prior to the start of the 2017 regular season. 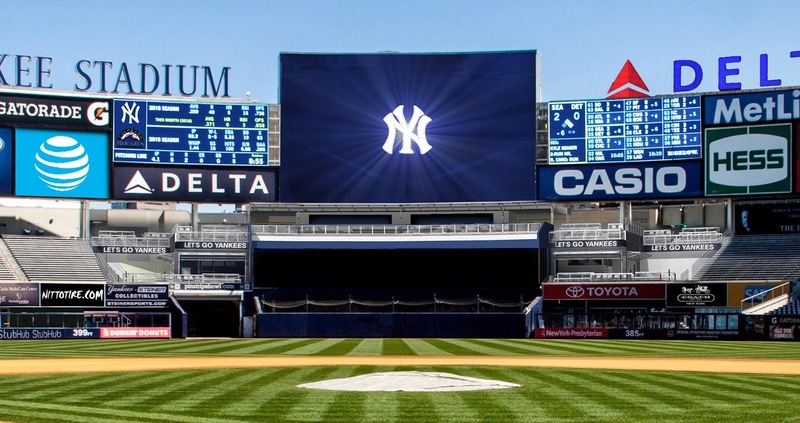 "We have listened to our fans and ticketholders and their top requests were for more family-friendly and socially-oriented spaces at Yankee Stadium," said Yankees Managing General Partner Hal Steinbrenner. "Yankees fans will now have many more dedicated areas for spending time with Guests who have tickets in other sections of the Stadium, allowing all Guests to be able to enjoy the game from multiple vantage points while having unique food and drink options available to them. We are also especially excited to provide an engaging children’s play area for families to utilize prior to and throughout the game. Having these types of spaces in Yankee Stadium is fundamental to the expectations of our fans, and we look forward to making them a huge part of the Yankee Stadium experience in 2017 and beyond." 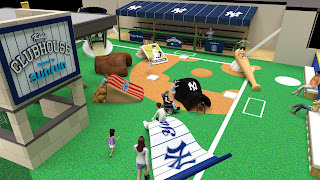 SUNRUN KIDS CLUBHOUSE: The Sunrun Kids Clubhouse will be Yankee Stadium's first-ever children's zone. Shaped like a mini-baseball field with a soft artificial surface, the 2,850-square-foot area will be located on the 300 Level in right field and will be outfitted with Yankees-themed playground equipment, including oversized baseballs, bases and baseball cards. The Sunrun Kids Clubhouse will be accessible to all Yankee Stadium Guests. Provided by New York Yankees. Children will be able to play among the colorful fixtures, including a 6-foot-high replica World Series trophy. Parents can join their children on the play area or choose to oversee them from a nearby dugout. Television monitors will ensure that no one misses any game action. There will also be a shaded section of the play area with interactive exhibits. The Clubhouse will also include two family restrooms equipped with changing tables. Nursing mothers will have an additional private space, which will include lounge chairs, a television and power outlets for those using electric breast pumps. MASTERCARD BATTER’S EYE DECK: Located on the 200 level in center field with a clear, sweeping view of the entire Stadium, the MasterCard Batter's Eye Deck will be expanded to 3,500 square feet and will include drink-rails overlooking the field. This outdoor gathering space will feature craft beers, cocktails and a large selection of food options. BULLPEN LANDINGS: The new left- and right-field Bullpen Landings (on the 100 Level in the former Sections 239 and 201, respectively) will be open-air social gathering areas which will overlook the visitors and Yankees bullpens. Both landings will feature their own specialty food and drink options. Drink-rail locations at the landings will have power/USB outlets. As a result of this reconfiguration, all obstructed-view seats in the Bleachers will be removed. Right field Bullpen Landing. Provided by New York Yankees. 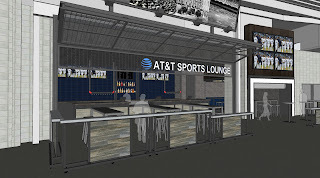 AT&T SPORTS LOUNGE featuring DirecTV service: The new AT&T Sports Lounge featuring DirecTV service at Section 134 on the Field Level will include a full bar with craft beers and cocktails. 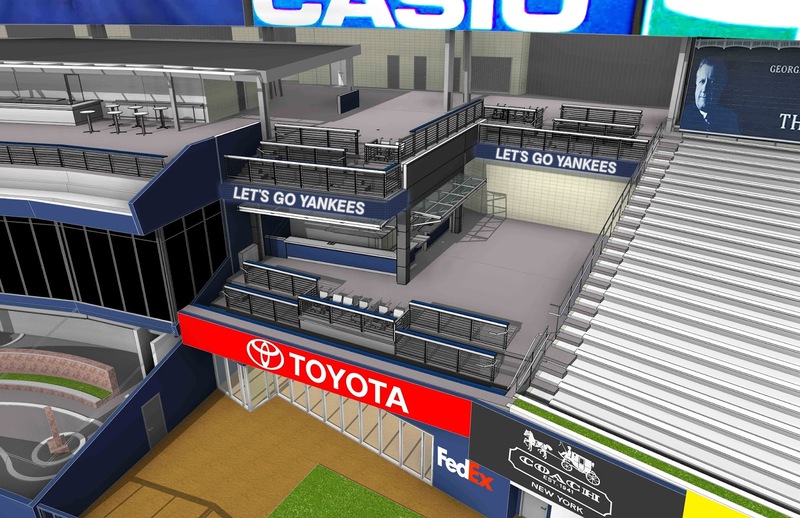 Tables, stools and large-screen televisions tuned to the Yankees broadcast and other live sporting events will provide a sports-bar atmosphere on the Stadium's main outdoor concourse in left field. Additionally, power/USB outlets will be available for charging phones or tablets. BUDWEISER PARTY DECKS: The 300 Level of the Stadium will include Budweiser Party Decks at Sections 311 and 328, featuring shaded stand-alone bar areas serving beer, cocktails and food. 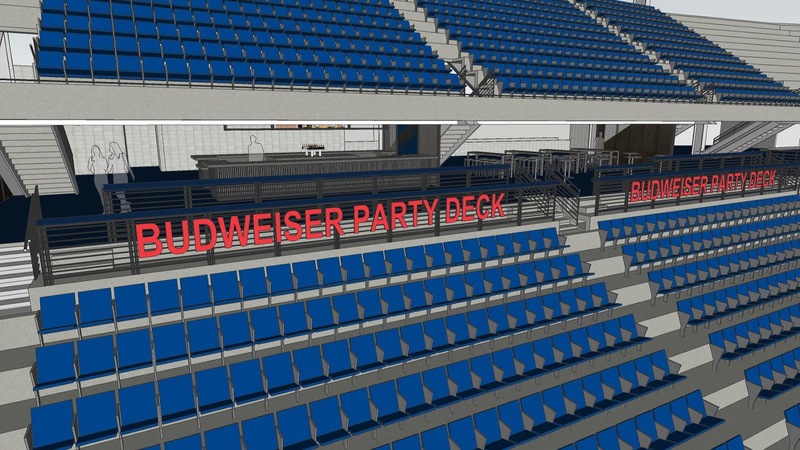 Drink-rail and barstool seating will provide fans a relaxed and casual setting from which to enjoy sweeping views of the field and game action. All areas described above will be open for New York City FC fans to enjoy in 2017. The impending construction will affect a very limited number of ticketholders for potential New York City FC playoff matches in 2016, all of whom will be directly contacted by the club. As a result of the offseason enhancements, the Yankees are removing just under 2,100 seats, including approximately 1,100 obstructed-view Bleachers seats and approximately 600 Terrace Level seats. Once the Stadium enhancements are complete, more than 200,000 additional tickets priced at $15 or less will be made available for the 2017 regular season. These tickets will be in addition to the traditional individual-game ticket specials the Yankees offer, such as MasterCard $5 Games, Half-Price Games and Youth Games. Later this year, additional information will be released regarding the Yankees’ 2017 ticket initiatives, ticket specials and pricing, including the introduction of variable and dynamic pricing. If you would like to follow the progress of the work, go to www.yankees.com/enhancements.